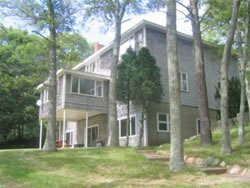 Martha's Vineyard Waterfront House on beautiful Lake Tashmoo in Vineyard Haven. This home comes with a deep saltwater dock and has ample space for 14 guests. There is a separate in-law apartment which is optional for a small additional fee to bring the number of bedrooms to 7. The main house has six bedrooms. There is a large separate kitchen with an adjacent dining room facing the Lake. You'll love this private location near everything.